Three-year-old Geonni Johnson has a huge heart and lots of spirit. Her mom says Geonni likes won’t say goodbye to you without lots of hugs and kisses first! So her parents knew something was wrong this past summer when that spirit started to flag. The family had been out of town for Labor Day weekend and on the Monday holiday, Felecia says Geonni went down for a nap, something that isn’t normal for her. The next day, her fever started and kept getting worse. So Felecia and Cleo took her to the pediatrician for answers. The doctor suspected pneumonia so he sent them straight to the hospital in their hometown of Montgomery. But Geonni’s wasn’t getting better. She was so weak that she couldn’t hold her head up and she had to be intubated to breathe. 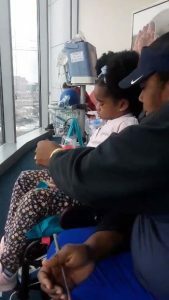 That’s when doctors decided to send her to Children’s of Alabama in Birmingham. Geonni’s condition worsened to the point that she couldn’t move her arms, legs or even her neck. Doctors diagnosed the toddler with acute flaccid myelitis (AFM), a very rare condition. Most patients with AFM appeared to start with a viral infection before developing AFM, according to the CDC. Doctors and researchers are working to understand why a small number of patients develop AFM when most patients recover with little lasting effects. There’s no cure or treatment. Felecia says all doctors can do is treat Geonni’s symptoms. 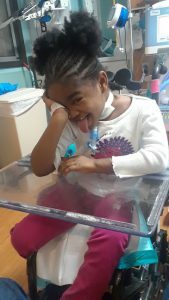 For now, doctors are focusing on physical and occupational therapy so Geonni keeps strength in her muscles and doesn’t lose motor function. Slowly, she’s been able to move her fingers and toes. She can know sit up on her bed and starting to move her arms more. She still can’t stand or walk. And as she recovered, doctors moved Geonni off the intubation to mechanical ventilation and her parents say she could start talking them again. “It’s a relief because she can tell us if she’s hurting or if she needs help to turn her over or sit up,” Cleo said. 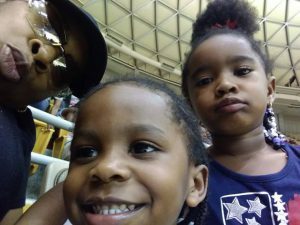 When Geonni was first transferred to Children’s of Alabama, Felecia and Cleo were staying in her room. “Before we came, there really wasn’t any rest in Geonni’s hospital room because the nurses come in every hour and it wakes you up,” Cleo said. “Being able to come to the Ronald McDonald House and have somewhere quiet is amazing. I’m always there [at the hospital], I rarely get to leave the room,” Felecia said. Cleo and Felecia agree that being at the Ronald McDonald House has been just as good for Geonni as it has been for them. 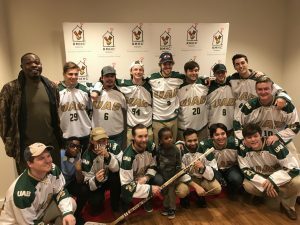 Cleo and Geo get to meet the UAB Hockey team at the Ronald McDonald House. “And being able to see her brothers every weekend has helped,” Felecia said. Geonni’s twin brother, Geo, and older brother, Jujuan, adore their sister. “They’re always so excited. When we hit the hallway, Geo starts calling, “Hey, Geonni! I’m coming!’” Cleo said. Felecia spends most of her time at the hospital to make sure Geonni is OK. This leaves Cleo free to take care of the boys and spend time with them. “I’m able to take care of them until we go over to the hospital. Being so close really helps. “The boys love coming to the Ronald McDonald House. We got to go to the zoo and McWane,” Cleo said. It’s not easy for the family to be apart during the week but the boys are adjusting. Felecia and Cleo pose in front of his work site, which is across the street from the Ronald McDonald House. “They understand that Geonni is sick and she needs special attention,” Felecia said. There’s another reason Cleo and Felecia are grateful to be at the Ronald McDonald House. “My job is right across the street and I can just walk outside and go to work,” Cleo said. Cleo has been working in construction for years and says that thankfully, his employer has had jobs open in Birmingham! 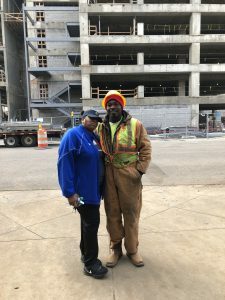 “I was on the 20/59 bridgework. After three weeks, I called my boss and asked him if I could go over across the street. I explained that I was staying at the Ronald McDonald House and he said I could move to the site across the street,” Cleo said. “I don’t have to go through traffic, worry about how fast I can get to the hospital if something happens. God is good,” he adds. “Since both of us aren’t working right now, it’s still very helpful for us to be here at the RMH,” Cleo. “It’s nice being able to talk to other people about their child and being able to share about our child and comfort one another,” Cleo said. “This is a great organization helping people who wouldn’t otherwise be able to stay up here and be with their kids. It’s really helped me. We don’t have a whole lot and there are people out there who have even less. It really does make a difference,” Felecia said. Cleo and Felecia says that Geonni is making wonderful progress and they are so hopeful for the future. We hope that their story has helped you learn more about how RMHCA helps families. In order to fulfill our mission, we need your help too! Please give today or volunteer your time so we can continue helping families who just want to be together when their child is sick!